Have you ever wondered where your name came from? Often when researching family genealogy, a namesake from an earlier generation will become apparent. For example: a son named after a grandfather or a daughter named after a favorite aunt. On the Genetti Family tree, sons are often named after fathers, grandfathers or an uncle. Each branch of our tree also has certain names that are passed down from generation to generation, identifying that particular family line. For example, you see the prevalence of Giovanni Battista, Pietro and Francesco in my branch of the tree. Another branch shows many Giorgio and Pietro ancestors. A third section of the tree has numerous Francesco Nicolo and Giovanni Battista. When I began researching my great-grandfather and his siblings, I found the names in his family to be poetic and a bit different from others in that generation. A few children were named after family members, but others had their own unique character. My “bisnonno” (great-grandfather) was Cosma Damiano – certainly an unusual name! Other siblings included: Sisinio Alessandro, Angela Maddalena, Angelo Rafaele, Agostino Leone, Dionisio Antonio and Erminia Enrica. All lovely, expressive monikers. But it was “Cosma Damiano” that I was fascinated by. There were no other men on the family tree with this name. Why had Catterina (my twice great-grandmother) baptized her second son with this odd name? With no clues to go by from the tree, I decided to do a web search. Perhaps he was named after a famous person or his “nome” had some other importance. The answer came immediately from Wikipedia. “Santi Cosma e Damiano” or Saints Cosma and Damiano, were early Christian martyrs who died in the 3rd century. Twin brothers, they were considered to be two of the earliest physicians. They practiced their profession of healing, refusing to take any payment for their services. OK, this was interesting, but why had Catterina chosen this name for her son? Reading on, I found the clue. 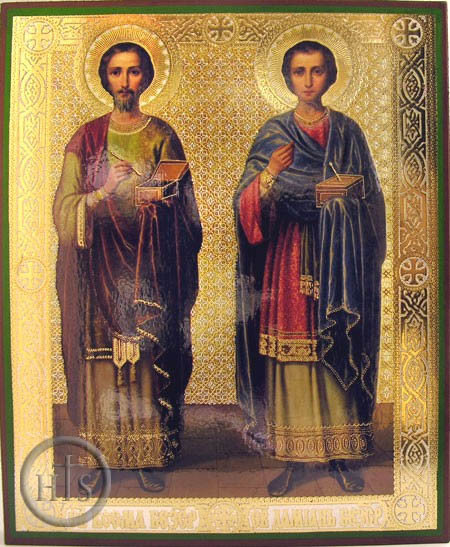 The feast day of Saints Cosma and Damiano was September 27. 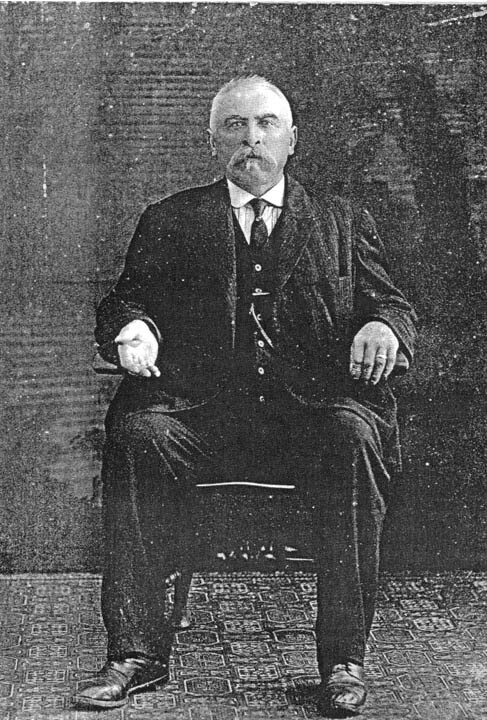 My bisnonno had been born on September 26, 1857 and baptized the next day on September 27th. His mother must have considered her baby’s birth to have an important synchronicity with this feast day. Although I have no proof to go by other than an educated guess, I believe this reasoning to be a fairly good conclusion of why the baby was named “Cosma Damiano”. – The Catholic church decided to move the feast day in 1969 from September 27th to September 26th, which coincidentally now coincides with Damiano Genetti’s birth date! – Damiano Genetti, like his namesakes, was also considered a physician by the Tyrolean people of Castelfondo, Italy and Hazleton, Pennsylvania. He was well-versed in herbal medicine and several other curative methods. And, like Saints Cosma and Damiano, he took no payment from anyone who sought his services. This information was related to me many times by Damiano’s grandchildren and by several people in Castelfondo. It was also documented in a book by Marco Romano, comprised of interviews by village elders. Damiano and his healing abilities were mentioned many times by those who knew and remembered him. If Catterina’s intention was to name her son after the two physician saints, it seems to have had a prophetic effect on Damiano’s life. Each of our relationships has a trajectory that death doesn’t destroy. We see its arc in the inner changes we undergo when we remember deceased loved ones, and even in outward changes as we continue to mold our lives in response to theirs. Patrick Genetti of the Sugarloaf Township Volunteer Fire Department (in PA) made the evening news yesterday. Thank you Patrick for a job well done! Click here to watch the video. I was browsing the posts on an obscure forum called “Trentino Genealogy and Culture“, looking for tidbits that might offer an ancestral clue. I’ve learned that information can sometimes be found in the strangest of places. An inquiry caught my eye. Someone was looking for info on her grandmother, a Marchetti from Nuremberg, Pennsylvania who was married to a Bott. Hmmmm … interesting, I thought. 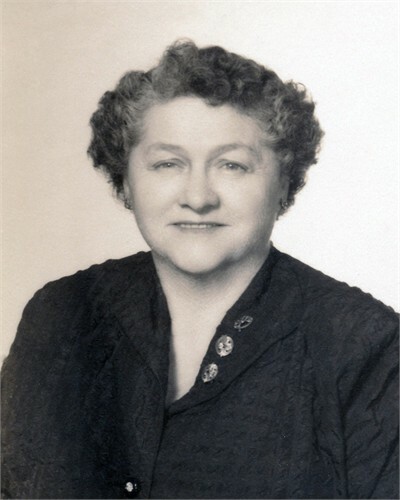 Since my paternal grandmother was Angeline Marchetti Genetti from Nuremberg, PA and one of my Genetti grand-aunts was married to a Bott, this post could provide a genealogy lead. The post was several years old, so I wasn’t sure the email address was still valid. I took a chance and composed a simple message introducing myself, explaining who my ancestors were, and offering the possibility that we could be related. I also included an invitation to visit The Genetti Family Genealogy Project website. Within 24 hours an answer from “FKL” was in my inbox. Yes, she was sure we were related – and possibly in more ways than one! Let’s see if you can follow this kinship line. It was confusing even for me! FKL’s grandmother (Anna) and my grandmother (Angeline) were sisters. OK, that’s an easy one to figure out. Since we share a common great-grandfather, (Angeline and Anna’s father – Giovanni Battista Marchetti) and because we are of the same generation, FKL and I are second cousins. Now comes the hard part along with a surprising Genetti twist. 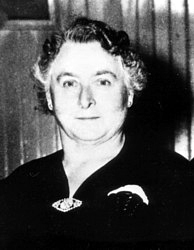 FKL’s grandfather was Guiseppi Bott (married to Anna Marchetti). Guiseppi was the brother of Verecondo Bott who married my grandfather’s sister, Dora Genetti (my grand-aunt). Are you following so far? Well Dora and Verecondo still have one living child, Helen. Because Dora and my grandfather (Leon Genetti) were siblings, that made my father and Helen first cousins. This means Helen and I are first cousins, once removed. Our closest common ancestors are Damiano Genetti and Oliva Zambotti – my paternal great-grandparents and Helen’s maternal grandparents (meaning that we are of different generations, thus first cousins, once removed). Since Verecondo was Helen’s father, that would make Guiseppi (FKL’s grandfather) Helen’s uncle. Therefore, Helen and FKL are also first cousins, once removed! Yikes! I was awake all night trying to figure this one out! 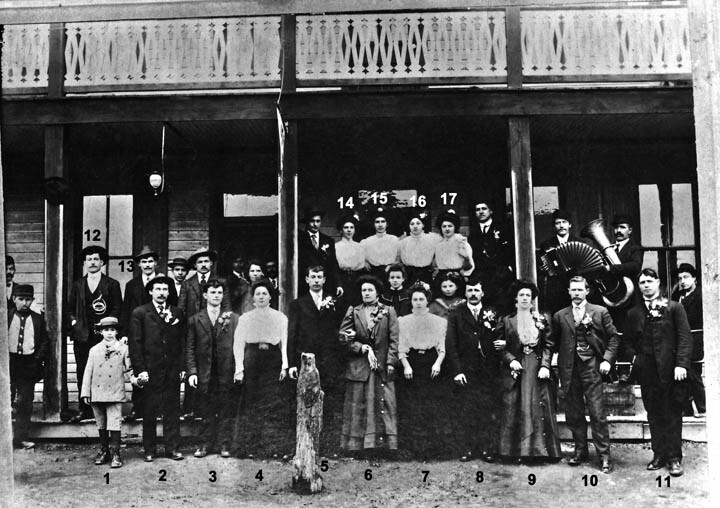 October 1906 – Weston, PA. Dora Genetti Bott is #4 and Angeline Marchetti Genetti is #17. Somehow I had accidentally stumble on multiple connections between three families … and a new 2nd cousin! Since we have many Marchettis and Botts on the Genetti family tree, this was a wonderful discovery. FKL and her sister plan to share their own family genealogy information with me so we can add it to our ever-growing online tree. I just love these accidental discoveries! They always open my eyes and heart to what a small world we live in! Most of you know that the Genetti Family Tree is large and extensive. Beginning in the 1400’s, it separates into two branches around 1590, and again divides into four main branches by 1680. The tree follows male ancestors only. Each name contains a birth year along with their spouse and marriage date. Death dates are not included. After the late 1700’s, a population boom is evident as the tree now blossoms out into many branches. Several years ago, when I began my genealogy research, I concentrated on my particular family line. This involved tracing the original baptismal, marriage and death records for each male ancestor, along with online searches through data bases and other family trees. As I found new information such as death dates, spousal birth and death dates, daughters and missing male children not included on the tree, I added this info to my file. After many, many hours of research I was able to identify and document 13 generations up to my grandfather, along with all of the children born to each ancestor, including birth, marriage and death dates. This information, along with vital stats on spousal families such as the Marchetti and Zambotti families, makes up the online family tree data base found on this website. Now comes the real challenge – researching the rest of the tree! Between blog posts and adding new photos and stories to the website, I continue to research separate individual branches of the Genetti tree. So far I have added one new line for the Genetti family who emigrated and settled in Illinois. I am currently working on a branch of the family who remained in Castelfondo and another branch whose descendants are in California and Wyoming. But it does take time, so be patient. I have a goal to completely document every Genetti ancestor from Castelfondo and attempt to locate their descendants’ country and state of emigration. If you would like to help with my research, please email me any information you have about your ancestral line. I will use this information to search church records and accurately document the ancestors before adding them to the online tree. 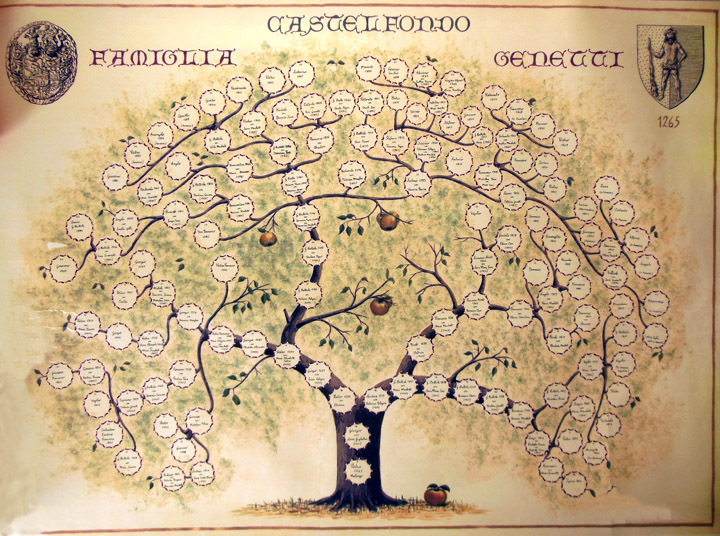 A special thanks to Chiara Dalle Nogare’s mother, Maria Genetti (one of the four Genetti sisters of Castelfondo), who I have recently learned, commissioned the beautiful family tree pictured above. I consult this tree every time I sit down at the computer for an afternoon of research. It has been an invaluable tool in tracing the Genetti genealogy. 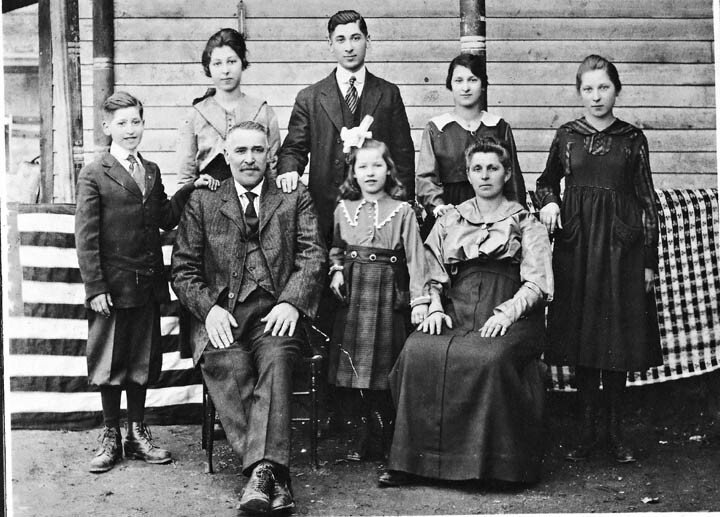 The Genetti Family Genealogy Project was featured today on the GeneaBloggers’ website: New Genealogy Blogs 23 August 2014. Click here to see the post! GeneaBloggers is described as “the ultimate site for your genealogy blog”. The site has a huge index of family genealogy blogs and also offers resources for bloggers. It’s a great way to get the word out about our website. And speaking about getting the word out, you can help the The Genetti Family Genealogy Project grow by emailing the website address and FaceBook page to other family members. The goal of our project is to share our family history and culture, and connect with Genetti descendants throughout the world. To do that we need participation! So tell one and all to visit, subscribe to our blog posts and “like” our FaceBook page. We are also looking for family photos, stories and recipes to post on the website. Mille Grazie! Why not stop by our Book Shop to peruse our sampling of personally selected books about the Tyrolean culture? If you are interested in learning more about your roots or are planning a future trip to Trentino-Alto Adige, you’ll find just the right book to help you in your adventure. Today I added a new book that was suggested by Chiara Dalle Nogare, one of our Genetti cousins who lives in Trento, Trentino. 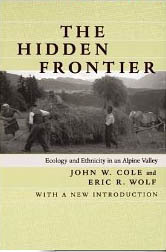 “The Hidden Frontier: Ecology and Ethnicity in an Alpine Valley” is a fascinated study of history and culture in the Val di Non. Well worth the read if you really want to understand your Tyrolean roots! Click here to visit the Book Shop! I have been receiving Filo since 2012. Through the magazine I have learned so much about our culture, food and language, as well as been intrigued by family stories that are publish in each issue. To receive the free magazine, simple register at: http://filo.tiroles.com/registration.html. Or to browse their extensive site, go to: http://filo.tiroles.com. If you are interested in learning more about dialect and in particular, the Nones language of the Val di Non (which is what the Genetti ancestors spoke), check out their dialect section. Quite fascinating! In closing, here is a bit of dialect from Filo: ‘sa fente, nente o stente? Which translates into: What should we do, stay or go? Why am I a genealogist? Many people find my hobby of family genealogy interesting – but exceedingly tedious when they learn how much research is required to accurately compile all of those names and dates. Often they ask “Why do you spend so much time digging into the past?”. So here are a few musings as to why I am a family genealogist. Whenever I pass by an abandoned home, usually sitting isolated and alone on an old farm or open prairie, I wonder who once lived there. What memories were created in this house with peeling wallpaper and shutters hanging askew? Why did they leave? Or who are the long-gone people in period dress peering out from a sepia photograph that I found at the flea market? And who once cherished this memento, but now they are gone too. Like the vacant home or the family portrait, people are also forgotten. It only takes three or four generations before an ancestor passes from living memory. And truly the only thing that is left after we pass is our memory. As a genealogist, I try to capture and preserve the memories of those who came before me. My charts and trees, names and dates are to honor the ancestors in an attempt to keep their memory alive. In some small way, I hope someone in the future will do the same for me. We all want to believe that our life counted for something, that it had purpose and enriched those we came in contact with. I believe every ancestor created a stepping-stone for the next generation. Their knowledge, courage and life choices made each of us who we are today. Shouldn’t we in the very least remember their names? The pursuit of genealogy is an awe-inspiring calling and one that I don’t take lightly. The Genetti clan was very fortunate – many relatives throughout the centuries took up the task of recording our ancestry. I am just one in a long line of family historians preserving the memory of past ancestors by compiling a family tree generation by generation. For in remembering and sharing a family’s genealogy, you join the lives of the past with those living today and those to come in the future.